Everyone gets excited when I make these fresh strawberry cheesecake bars. They have a crunchy graham cracker crust, a layer of silky smooth cheesecake, and fresh sugar strawberries on top. It’s a classic cheesecake recipe and definitely one to add to your dessert rotation. I’m not sure if it’s because people don’t make cheesecake at home, or if people truly like cheesecake more than vanilla or chocolate cake. But whenever I bring cheesecake to a dinner party or potluck people go crazy. And I want people to go that crazy when you bring dessert too. Seriously, people will love you if you bring them cheesecake. 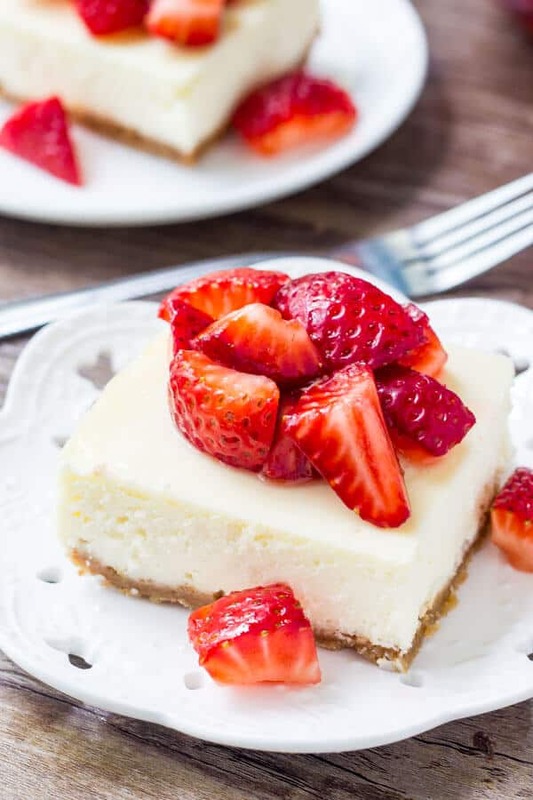 Now the other day I shared my ultimate guide of how to make cheesecake – which has just about everything you need to know and tons of tips & tricks. 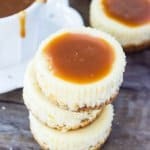 So if you’ve been inspired to try your hand at making cheesecake, then you definitely need to try this recipe. 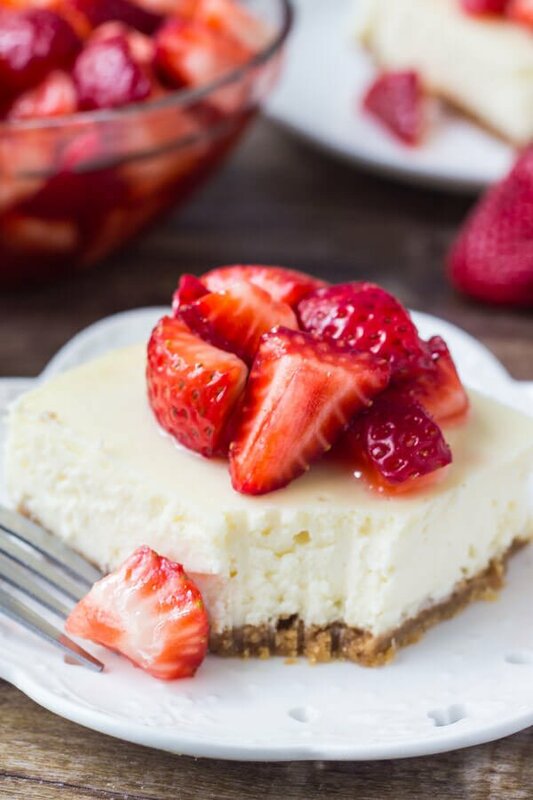 These strawberry cheesecake bars are the perfect classic cheesecake recipe. And since they’re made in a 9×13 inch pan – you don’t even need to go out and buy a springform. They start of with a graham cracker base – which I like to bake first because that way you get a crunchier crust. Then the cheesecake layer is smooth, creamy & just all around plain amazing. 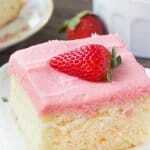 Adding sour cream in addition to the cream cheese makes the cake silky smooth. Then I added 2 tablespoons of flour to the batter to reduce the chance of cheesecake cracks. (This helps bind everything together). For this recipe, I like to bake the cheesecake at 325F degrees. Cooking a cheesecake slowly at a lower temperature helps to keep moisture in and leaves your cheesecake silky smooth. Turn off the oven & open the oven door. Cool the cheesecake in the oven with the door open for at least 30 minutes. Then continue cooling on the counter and the cheesecake & pan are room temperature. Cover and place in the fridge to chill. For the topping, we’re making sugared strawberries with fresh berries. It’s so simple and the strawberries really shine because we’re not doing much to them. These fresh strawberry cheesecake bars are classic, simple and always a hit. So if you’re wondering what to make for strawberry season – I highly recommend these cheesecake bars! 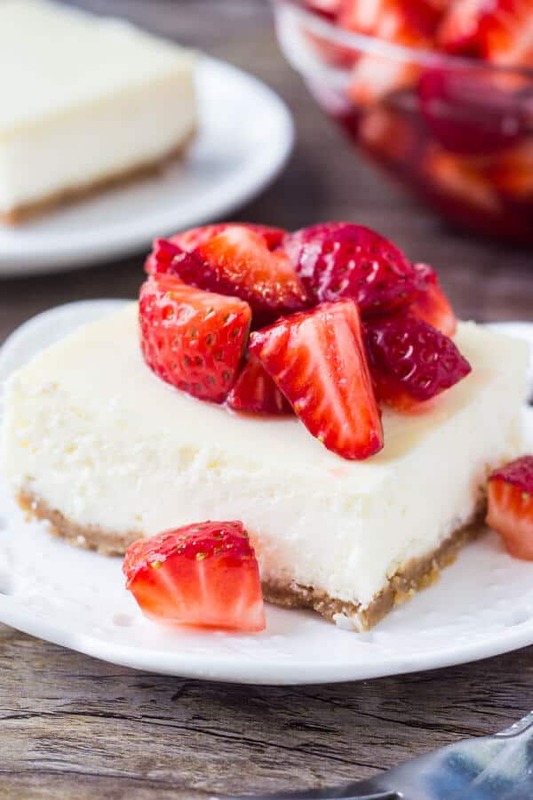 Fresh strawberry cheesecake bars have a crunchy graham cracker crust, a layer of super smooth vanilla cheesecake and are topped with sugared strawberries. Made in a 9x13 inch pan - so it's perfect for your summer BBQs. Line a 9x13 inch glass baking pan with aluminium foil and lightly grease. To make the crust in a medium bowl stir together the graham cracker crumbs, 2 tablespoons sugar and melted butter. Pour into the bottom of the prepared pan and pack down tightly. Bake for 8 minutes in the preheated oven. Then remove from the oven and cool. In a large bowl beat the cream cheese until very soft (2 minutes). Then beat in the sugar, vanilla & lemon juice, followed by the sour cream and flour. Turn off the mixer and scrape down the sides of the bowl. Then beat in the eggs one at a time at low speed. Hit the bowl against your counter about 10 times to remove as much air as possible. Then pour over the prepared crust. Bake in the oven for 35-45 minutes or until the top looks set except for a small circle in the very center, and if you give the pan a gentle nudge it still has a wobble. Turn off the oven, open the oven door and cool the cheesecake in the oven for 30 minutes. Then remove and continue cooling til it reaches room temperature. Cover and chill in the fridge for at least 6 hours or overnight. 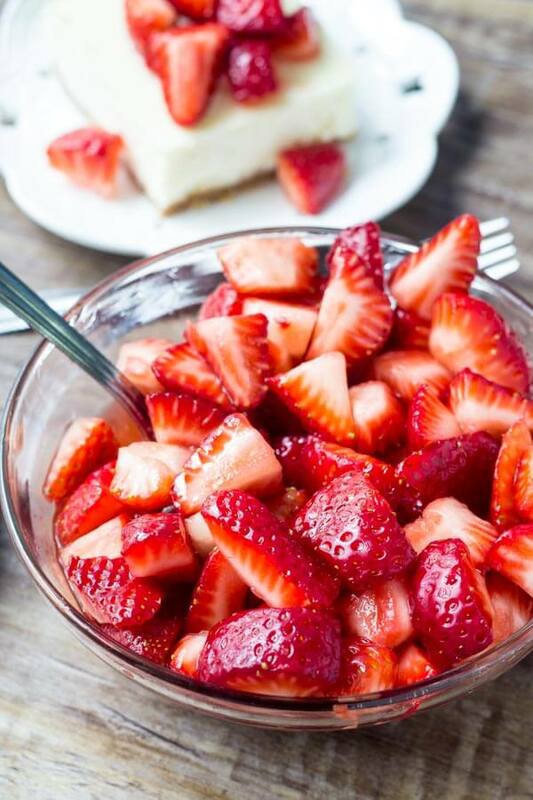 A few hours before you're ready to serve, haul the strawberries and chop into quarters or eighths. Toss with sugar and set in the fridge. 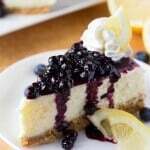 To serve, cut the cheesecake in slices and top with sugared berries. Lovely summer recipe! 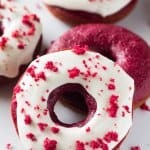 Will be a great way to use strawberries while they are in season. Could you just use a metal baking pan instead of doing the foil in the glass dish? I’d just use a glass dish and grease it lightly. The foil is really just to help you remove it from the pan more easily. I wouldn’t use a metal pan since metal isn’t as great when you’re cooking something like this that needs to bake for a long time.